The formal entrance features a front covered porch with solid oak entry door. Inside the foyer features 10' ceilings, plaster crown moldings and elegant chandelier. With its classic centre hall design the front foyer is flanked by a formal living room featuring an abundance of windows, natural gas fireplace with floor to ceiling marble mantle and a formal dining room with wood panelled walls and stealth in-ceiling speakers. The heart of home is without a doubt the open concept kitchen and family room area which sprawls across the rear of the home. The family room features a elevated natural wood burning fireplace visible from all areas of the room as well as a custom built-in bar area showcasing a glass enclosed wine cellar. The kitchen features an abundance of cabinetry by Braam's Kitchens, a large island with seating for 4, Calcutta marble counter tops, high end Wolf and Subzero appliances as well as a servery and walk-in pantry. 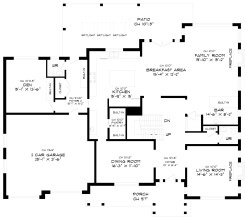 In addition the main floor also offers a private study, large mudroom with secondary washer/dryer, a formal powder room and a secondary powder room conveniently located at the rear of home with easy access to the rear covered porch, pool and hot tub. The upper level, in addition to the spacious master retreat features 3 additional bedrooms as well as a second floor laundry room. The master bedroom features his and her walk-in closets and a spa like master bath with heated marble floors, stainless steel skirted stand alone tub, large walk-in shower with dual rain heads and his and her custom vanities with Calcutta marble counter tops. Bedroom 2 features a private 3 piece ensuite with heated stone floors and seamless glass shower and floating vanity. Bedrooms 3 and 4 feature a unique 6 piece shared bath allowing each bedroom the privacy of having its own water closet as well as sharing a deep soaker tub and walk-in shower. All bedrooms feature walk-in closets as well as custom built-in closet organizers. The laundry room also features heated stone flooring, custom cabinetry and ample hanging space. The lower level of this wonderful home offers a very spacious rec room featuring large oversized windows which allows for great natural light as well as a linear natural gas fireplace with stone mantel. The lower level in addition offers 9.5 foot ceilings, a 5th bedroom, a 3 piece bathroom and a large home gym with cork flooring, mirrored wall and sliding glass door. The exterior of the home features a private fully fenced rear yard, partial ravine setting, custom gunite pool and hot tub by Todd Pools, covered front and rear porches, stone patios, full irrigation system, outdoor security cameras and circular drive. Overall this home blends classic design and tasteful decor throughout all while incorporating warmth and seamless functionality. Making it a wonderful family home for many years to come!